Michelangelo was born on March 6, 1475, in Caprese, Tuscany. He was born into a once prosperous family of Florentine bankers who had recently come on hard times. After the collapse of the families bank, his father Ludivico was forced to take a job in the city of Caprese as a judicial administrator. Then, shortly after Michelangelo was born, the family moved back to Florence. In Florence his mother became very ill, and died while Michelangelo was just 6. At that time he was sent to live in the town of Settignaro, where his father owned a marble quarry and a small farm. 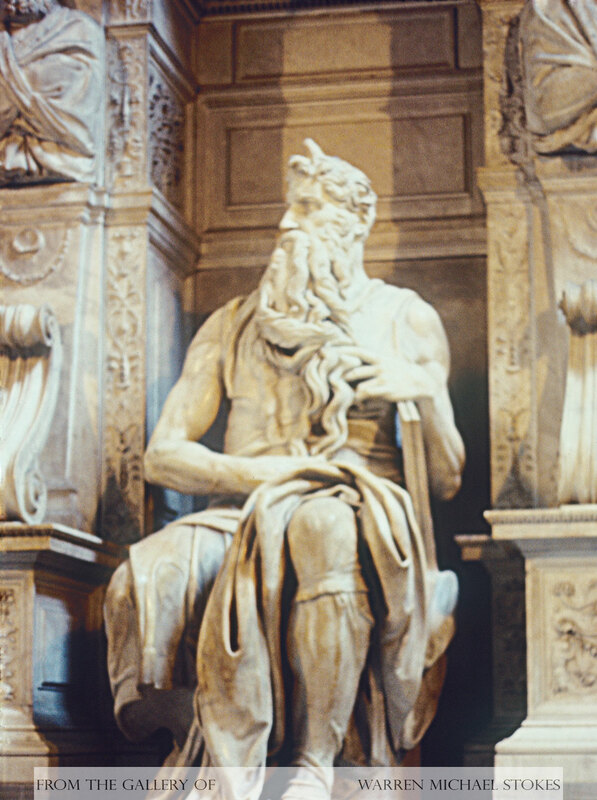 In Settignaro, Michelangelo lived with a stone cutter and his wife. A few years later he would once again be united with his family in Florence. At this time his family wanted him to receive a formal education. However, Michelangelo was only interested in painting. Instead of attending school, he passed his days copying church paintings and hanging out with other painters. At the age of 13, Michelangelo became an apprentice for the great fresco painter Ghirlandaio. Ghirlandaio had the largest studio/workshop in Florence. Soon afterward he gave Michelangelo a paid position. Then just a short time later, Lorenzo de Medici would ask Ghirlandaio, “ Who are your two best students?”, he replied, “Michelangelo and Francesco Granacci.” From then on, Michelangelo would work for the De Medici family. He spent the next two years studying at a Humanist academy. There he sculpted the “Madonna of the Steps” and “Battle of the Centaurs.” Then, in November of 1497, he would be commissioned to carved a Pieta, which was a sculpture of the Virgin Mary grieving over the body of Jesus. This would become one of the greatest sculptures of all time. Probably, his greatest achievement was the statue of biblical hero, David. One of his advisers for this project was the great Leonardo Da Vinci. This incredible statue is 18 feet in height. David, who was armed with a sling and stone, was carved from a single block of marble, and took 3 years to finish. Michelangelo exaggerated many of David's features so that he would look perfect, including the bulging muscles. According to Michelangelo, David represented the beauty and grandeur of the human spirit. The Vatican's Sistine Chapel was originally commissioned by Pope Sixtus IV. It took Michelangelo four years to paint the ceiling of the chapel, which was the largest chapel in the Vatican. The painting covered 6,300 square feet and featured 300 larger-than-life figures. Michelangelo painted alone, on his back, supported by scaffolding, very high above the floor of the chapel. In the center of the chapel he painted the first book of the Bible, Genesis in 8 huge panels. It was Michelangelo's idea to start with the drunkenness of Noah and end with the Creation. Originally, he didn't want the job because he believed that painting was inferior to sculpting, and he complained bitterly. There was an amazing amount of controversy after its completion. Just ten years after its completion Pope Hadrian VI condemned it, calling it a “bathroom of nudes.” However, the Sistine Chapel would become one of the greatest masterpieces that the world had ever known. Almost three years later he would paint the wall behind the alter with a fresco called “The Last Judgment.” Michelangelo would work almost non-stop until his death at the age of 89.